Several years ago, I received a very generous gift. My great-aunt, whom I had never met (she had moved out of state long before I was born), had recently passed away, and found in her effects were several pieces of Cleveland Indians memorabilia. Given my reputation as an Indians fan, I was offered these pieces by my aunt in Florida. I accepted, though I had no idea what I’d be getting. I was surprised, to say the least. 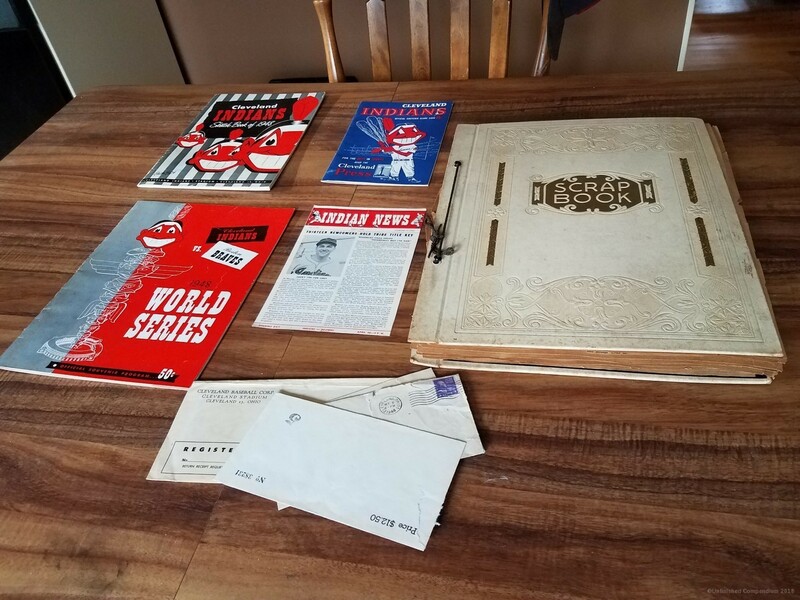 There is one item that is from a different season, but all the rest of these items are from the 1948 championship season. The only exception being the score card, which is from the 1954 season (and which is special in its own right). Cleveland Indians Sketch Book of 1948. A promotional book that I believe was sold separately as well as given away for at least one game (the doubleheader against the Yankees on May 23). Includes pictures and profiles of players, coaches, and the front office, as well as some historical features on teams of the past. Cleveland Indians scorecard, September 1954. To be more specific, this is from the September 25 11-1 victory over the Tigers, which was the 111th and final victory of the season. My great-aunt scored the game, making several notes on player moves and other details. A scrapbook full of newspaper articles from August-October 1948. The articles and photographs are mostly from the Plain Dealer, though there are a couple of Cleveland Press clippings. I’m not sure I can show these because they are still covered under copyright, but at the very least I’ll describe them in a later post. Ticket envelopes and forms from 1948. The postmark on the return envelope was marked October 2, 1948, which was four days before the World Series began, so I assume either it contained ticket(s) for Game 5 (which my great-aunt attended) or a refund. One of the photos in the scrapbook showed a long line of fans at Cleveland Stadium attempting to get tickets for the World Series, and my great aunt noted that she was in this line, so maybe she got the ticket that way. 1948 World Series program, Cleveland edition. This is from Game 5 of the World Series, as it contained a completed scorecard from the game. There is also a second World Series program in the scrapbook. Indian News from March 1948. A four-page pamphlet on the coming season, with details on ticket packages. This is going to be what I’m covering in detail next time; the remainder of the items will be covered of the course of this season, which is appropriately enough the 70th anniversary of the franchise’s last World Series championship. The plan for this series is to showcase these items in the context of what was happening with the team at the time, and to glean what details I can about how Cleveland fans were feeling about the amazing 1948 run. And, on a selfish note, try to find out a bit more about a relative I never knew but also have something in common with. So without further ado, a closer look at the Indian News pamphlet.